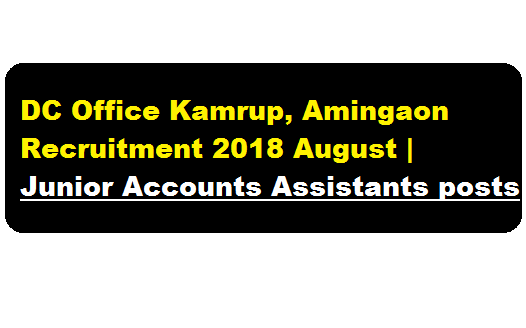 DC Office Kamrup, Amingaon Recruitment 2018 August | Junior Accounts Assistant :- Office of the Deputy commissioner , Kamrup District , Amingaon has issued a recruitment notification in 29th August 2018. According to the latest DC Office Kamrup, Amingaon Recruitment 2018 August Applications in Standard Form as prescribed in the part-IX of the Assam Gazetted stating full particulars along with self attested copies of necessary certificates of educational qualification and other testimonials are invited from the intending candidates for filling up of the 6 nos of Junior Accounts Assistants posts lying vacant in the office of the Treasury Establishment at Kamrup District.We have discussed about this recruitment in the following section. In this section, we will discuss in detail about Recruitment of Junior Accounts Assistant posts under DC Office Kamrup, Amingaon Recruitment 2018 with all the details and requirement. Age Limit : As per Govt. O.M. ABP-06/2016/04, dated 03.03.2016, candidates must not be less than 18(eighteen) years or not more than 43(Forty Three) years as on 01.01.2018. The upper age is relaxible by 5 years in case of candidates of SC/ST and persons with disabilities. Self attested copy of age proof certificate must be submitted along with the application. i) Attested copies of Educational Qualification. ii) 2 (two) copies of recent passport size photograph duly attested by Gazetted Officer. iii) 1 (one) self addressed envelope of 5 cm size affixing postal stamps of Rs. 5(five) only. iv) Incomplete application shall be rejected forthwith. v) No application shall be entertained after the expiry of the last date of submission. Application complete in all respect should be send to the following address- The Deputy Commissioner, (Treasury Establishment), Kamrup, Amingaon, Guwahati- 31. Last date of submission of application form is 15.09.2018. 1) The candidate must be a citizen of India as defined in article 5 to 8 of the Constitution of India. 2) Self attested copy of Caste/Tribe certificates must be submitted along with the application form. 3) Candidate already in service must apply through proper channel. B) Candidates who qualify in the written test shall have to appear in computer and personality test for 50 marks for final selection on date that will be notified later on. 5) The list of candidates who qualify in the written test and computer and personality test shall be hanged in the D.C’s Office, Kamrup District, Amingaon and Kamrup District Treasury, Amingaon, Guwahati-31. 6) Reservation of post shall be applicable as per existing Govt. guideline. 7) No TA/DA shall be admissible for the journey performed in connection with the written test and interview. 8) Inclusion of a candidate name in the panel list shall confer no right to appointment unless the appointing authority is satisfied after such enquiry as he/she may consider necessary that the candidate is suitable in all respect for appointment. Canvassing directly or indirectly shall be treated as a disqualification of the candidate and the undersigned reserves the right to refuse him/her appointment even if he/she was selected by the selection Board. 9) Candidates finally selected must be willing and prepared to serve if any Treasury Sub-Treasury within the District of Kamrup. Educational certificates khini Self attest koribo lage ne Gazzetted officer e koribo?? application form khon kun khon?